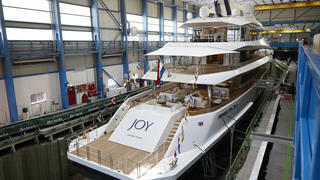 The launch of 70 metre Feadship superyacht Joy earlier this year marked a significant milestone for London-based studio Bannenberg & Rowell, as their first exterior design. We spoke to company leader Dickie Bannenberg and director of exterior design James Carley to get the inside story. The owner of Joy was keen to create something “totally different to every other yacht” and this is something Bannenberg embraced: “This is our first new exterior design so we were keen to explore different routes to what we had worked on before. The superstructure certainly fulfils this brief — by building on the design language established through Bannenberg & Rowell’s concept work, this textured surface is immediately recognisable. As well as the aesthetic appeal of this design, it also has some practical benefits. “We wanted to connect with the surroundings, to garner the best views out and allow as much light in as possible,” Carley explained. 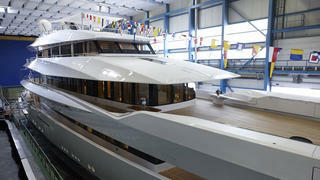 At launch, Joy measured up at 70.00 metres LOA, but she wasn’t always meant to be this length, as Bannenberg revealed: “The yacht was lengthened from 63 metres to 70 metres fairly early in the production cycle. 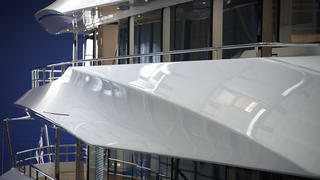 This was mainly forward of the main superstructure and so didn’t affect the exterior design too much.” However, this extension creates an expansive foredeck, which is strongly linked to the main deck master cabin, via floor-to-ceiling windows that encourage an interaction between the internal and external spaces. 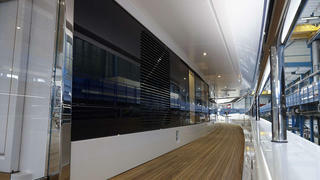 However, this extension creates an expansive foredeck, which is strongly linked to the main deck master cabin, via floor-to-ceiling windows that encourage an interaction between the internal and external spaces. The beach club on Joy is another stand-out feature that emphasises the connection between internal and external spaces. This area can be accessed in two ways — either from the large bathing platform via a hinging transom, or directly from the aft deck through the “bomber doors” that open up to reveal a large staircase. “We started out with an architecture developed by Feadship which, to some extent, we were allowed to manipulate, initially by repositioning areas and introducing horizontal and vertical connectivity between adjacent spaces. This created an ease of flow and movement around the yacht,” Carley added. The beach club on Joy is another stand-out feature that emphasises the connection between internal and external spaces. This area can be accessed in two ways — either from the large bathing platform via a hinging transom, or directly from the aft deck through the “bomber doors” that open up to reveal a large staircase. “We started out with an architecture developed by Feadship which, to some extent, we were allowed to manipulate, initially by repositioning areas and introducing horizontal and vertical connectivity between adjacent spaces. This created an ease of flow and movement around the yacht,” Carley added. The fine craftsmanship that went into Joy can be seen in the small details, such as the teak planking on the elegantly curved side decks.